A year ago a small ad agency based in Hechingen, south Germany commissioned me to design them a studio for their fledgling company. Unfortunately their start-up stopped before it started and the studio was never realised, but before it did stop we had just enough time to come up with a design. 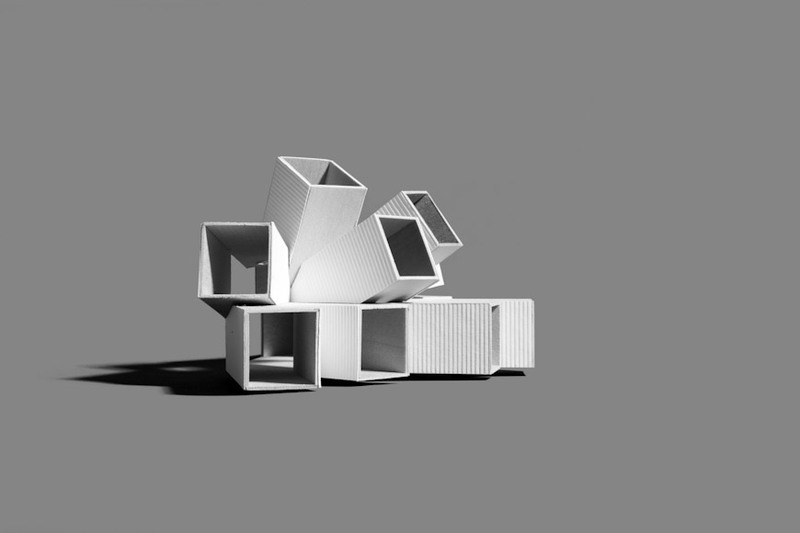 Inspired by the growth of crystals in a chemistry test tube I designed a studio using shipping containers as the raw material. Fanning out from a central core, the containers created a floor plan that would allow teams to have their own spaces while still allowing all activity to be seen, encouraging cross pollination of ideas. Above ground floor the containers reached up towards the sky, tracking the suns path and channelling light back down into the heart of the building. I even had enough time to give Michael Poulard, at Gardiner & Theobald, a quick call and he put me in touch with their Berlin office. As luck would have it the quantity surveyor in the Berlin office had just finished working on a job that involved a lot of steel work and he instantly knew who to speak to about sourcing shipping containers from Rotterdam, before being cut and welded by a company in north Germany, before being delivered to site in south Germany. It all started to look quite feasible on their modest budget of £250,000. You can find out more details on my website under Projects - Hechingen Studio.